The new bridge could help relieve a legacy of major congestion issues for automakers, suppliers and logistics companies between the U.S. and Canada. DETROIT -- Canada's transportation agency has given conditional approval to billionaire Manuel "Matty" Moroun's Detroit International Bridge Co. to build a long-sought new Detroit River bridge that would replace the aging Ambassador Bridge. The new bridge -- coupled with the planned Gordie Howe International Bridge Project, nearby in Detroit -- could relieve a legacy of major congestion issues for automakers, suppliers and logistics companies between the United States and Canada. DIBC announced Wednesday its Canadian subsidiary, Canadian Transit Co., has won approval from Transport Canada to construct a $1 billion (all figures in U.S. dollars) six-lane cable-stayed bridge alongside the four-lane Ambassador Bridge, which opened in 1929. Rob Wildeboer, executive chairman of Canadian parts firm Martinrea, told The Globe and Mail newspaper Thursday that foreign companies considering investing in Canada fear the potential of vehicles and parts “getting stuck for a long time” at the border under the current one-bridge system. "I think that the flow [of investment] does have something to do with the logistics," the paper quoted him as saying. Transport Canada said in a statement Wednesday that the Ambassador Bridge would have to be dismantled within five years of a new span opening and that the bridge company would have to make improvements to local infrastructure and public green spaces in Windsor. The Canadian permit sets the stage for a race between Moroun's company and the governments of Canada and Michigan to build competing new bridges over the Detroit River following a years-long battle over control of the international border. Matthew Moroun, vice chairman of his family's company, said DIBC has already spent $500 million in the development of land and roadway infrastructure to build a second span. The Moroun-owned bridge company has sought a twin span to the Ambassador since the early 1990s. "There have been many challenges our company has faced over the years in pursuit of this moment," Mathew Moroun said Wednesday in a statement. "We are now tasked with the duty to construct a privately funded bridge with the hard work of thousands of engineers, steel workers, construction experts that will be employed to deliver this once in a lifetime project." Marc Garneau, Canada's minister of transport, said his country is still moving forward with its plans to build the Gordie Howe International Bridge, connecting an Ontario's Highway 401 south of Windsor with southwest Detroit and I-75 on the U.S. side of the river. "The construction of the replacement Ambassador Bridge together with the Gordie Howe International Bridge project will ensure that Canadians continue to benefit from the efficient movement of people and goods at this crossing while providing infrastructure improvements for the local community," Garneau said in a statement. Gov. Rick Snyder, who battled the Moroun family over his pursuit of a new publicly owned bridge, emphasized Wednesday that the Canadians will allow only a replacement of the Ambassador Bridge to be constructed. “Today’s announcement reflects that reality and also addresses the physical limitations of the 87-year-old Ambassador Bridge by calling for a replacement span, rather than the construction of a ‘twin’ span," Snyder said in a statement. "However, construction on a replacement span would not begin unless and until further governmental approvals in the U.S. are obtained and several conditions established by Canada are met." One of the remaining hurdles is the DIBC needs to get approval from U.S. Department of Interior and the Michigan Department of Natural Resources for use of the air rights for the new bridge to cross over Riverside Park in Detroit, state officials said. In 2015, the City of Detroit swapped 3 acres of Riverside Park that the bridge company needs for the new span in exchange for five acres and $3 million in park improvements. 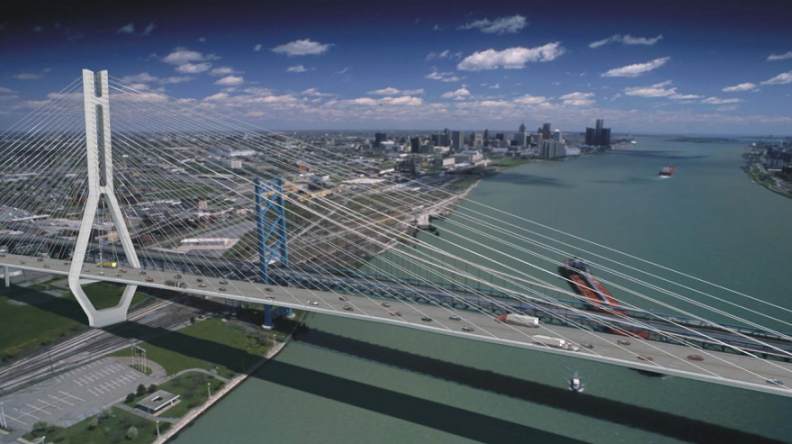 The DIBC said construction of a new 667-metre (2,190-foot) span would cost $500 million to tie into the Ambassador Bridge's existing highway connection to I-75 in Detroit and Huron Church Road in Windsor. Dan Stamper, president of DIBC, said the Canadian permit comes after the U.S. Coast Guard granted its conditional approval last year. "A lot of folks heard Canada will never give us a permit to build a new bridge," Stamper told Crain's Detroit Business, an affiliate of Automotive News, on Wednesday. “Our hope is this really changes the landscape that we’ve been dealing with for the last decade." The Moroun company's $1 billion total cost estimate for a second span is a far lower potential price tag than the $4.5 billion estimated cost of constructing the Gordie Howe International Bridge downriver. The Canadian government has vowed to finance that project after Michigan lawmakers refused to help fund it. The Gordie Howe bridge's costs include connections to Michigan and Ontario highways, a $250 million U.S. Customs plaza and assembling 184 acres of land in Delray, some of which Moroun owns. DIBC's plans to build a replacement bridge advanced while planning for the Gordie Howe bridge has recently slowed. Last week, the Windsor-Detroit Bridge Authority gave three consortiums of companies about six more months to submit plans for constructing the new bridge. Plans are now due in May 2018 instead of this coming November. The international bridge authority insists construction of the new bridge will begin sometime in 2018. Under the Canadian Transit Co.'s proposal for a second span, two of the six lanes on the new bridge would be dedicated to low-risk prescreened passengers and truck traffic using the joint U.S.-Canadian border-crossing programs known as NEXUS and FAST (Free and Secure Trade). Those programs expedite travel time across the international border for frequent drivers by reducing vehicle inspections. Backups at the Ambassador Bridge have long been a source of complaints among commuters and commercial truck drivers. "The proposed replacement span would considerably improve the flow of commercial goods and passenger traffic by allowing the anticipated benefits of the FAST/NEXUS programs to be achieved," the Canadian Transit Co. wrote in its 2014 application for a new bridge. "Both the Canadian and American customs agencies have requested that the replacement span include a dedicated FAST/NEXUS lane in each direction." In its 2014 permit application, DIBC had propossed maintaining the Ambassador Bridge as a back-up crossing for emergencies and used for operational vehicles and public events. But Transport Canada's conditional permit says the DIBC's subsidiary "shall demolish or cause to be demolished the Ambassador Bridge ... within five years from the day on which the replacement bridge opens to traffic."